At this popular annual event, more than 100 vendors from across Ontario, Quebec, and even Atlantic Canada, are expected at the event, which organizers describe as the largest antique show in Eastern Ontario. The event has survived for nearly a quarter of a century because it caters to both kinds of antique collectors. Showcasing a large variety of antique and collectible treasures. 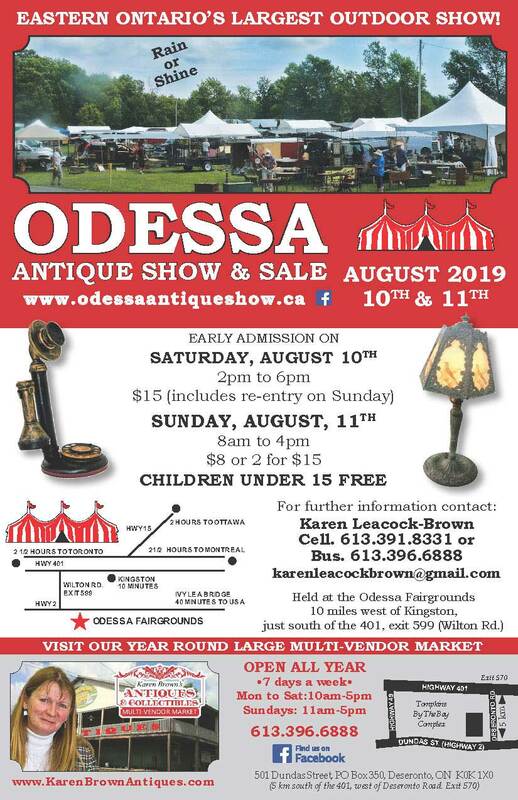 Held at the Odessa Fairgrounds, 10 miles west of Kingston Ontario. Collectors can count on discovering everything from furniture to household items, tools, textiles, paintings, folk art, jewellery and glass and china. Whether you're hoping to decorate your home with heritage objects or retro pieces or add to a long-held collection, the Odessa Antique Show will no doubt yield many fascinating finds. The prices suit every budget, ranging from a few dollars to a few thousand dollars. 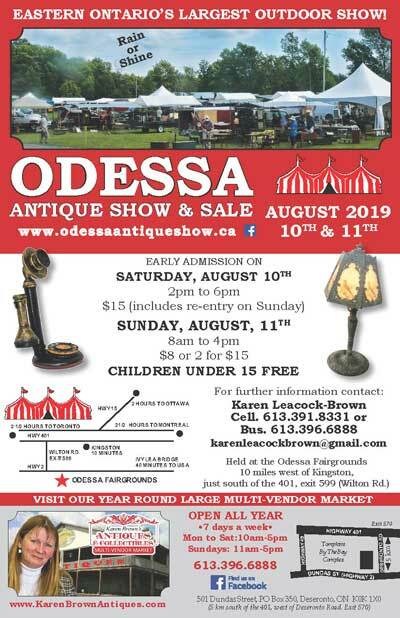 The Odessa Antique Show is an excellent deal and a great event for a summer afternoon, not only for antique lovers but for anyone interested in eye-catching memorabilia. No reproductions are allowed. This is an antique & collectibles show.